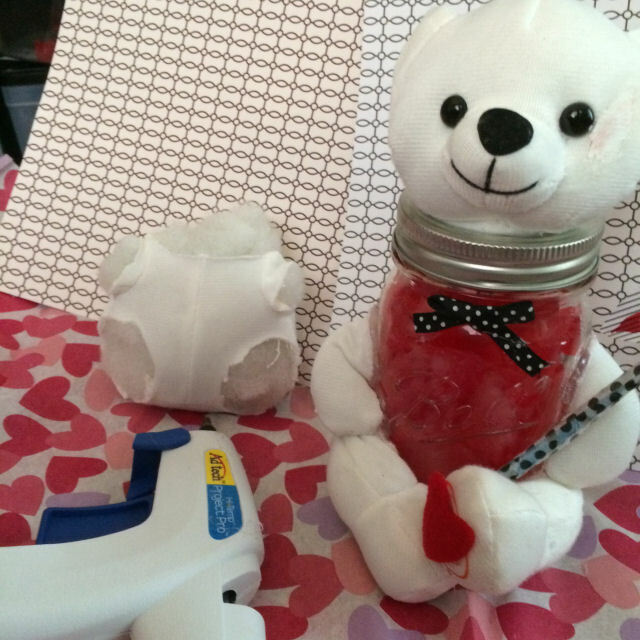 Have you ever seen a really cute and creative Valentine’s Day gift and wondered how it was made? Well I just saw the cutest little gift that uses a small little teddy bar, a jar and some other decorations. You may be wondering what do a jar and a teddy bear have in common. All we have to do is think about Winnie the Pooh and his many honey jars that he kept around the house. Jars of honey and bears go hand in hand. Sort of like frogs and lily pads, or bunny rabbits and carrots, or better yet cats and catnip. 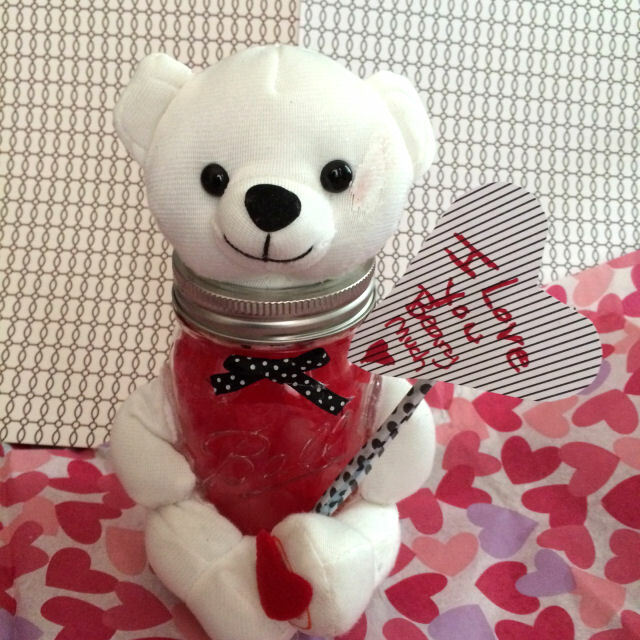 Now that I have your mind imagining all different types of animals and the foods or things they enjoy you have to check out this crafty DIY Valentine’s Day Bear idea. Now the idea involves dismantling a stuffed bear and then putting it back together around a glass mason type jar. You then fill it with the sweet candy of your choice and give it some razz with your favorite decorations and its ready to be gifted. Just think about how your loved one will enjoy receiving a homemade gift. There is nothing like a homemade craft gift that shows the recipient how much love and care you put into it. Be sure to tell me what you think and share your pictures of your lovely Valentine’s Day Bears. This is bear surgery, but for a very cute cause! Embellishments of your choice (I used a small bow, a felt heart, scrap book paper and a stick for his sign). You will cut off the body parts of the stuffed bear, and apply a generous amount of hot glue to the stuffing of the body part. Tip, cut one body part at a time and glue one section at a time, this helps you in the placement, and it is easier to keep the stuffing in place. I started with the head, then did the arms and legs. You just glue the body parts onto the jar in the same general position that they were on the stuffed bear. Then embellish up your sweet bear. I added a little bow at his neck, and cut a small heart from a piece of felt for his foot. Then I made his sign. I cut a heart from scrap book paper, and wrote my message. 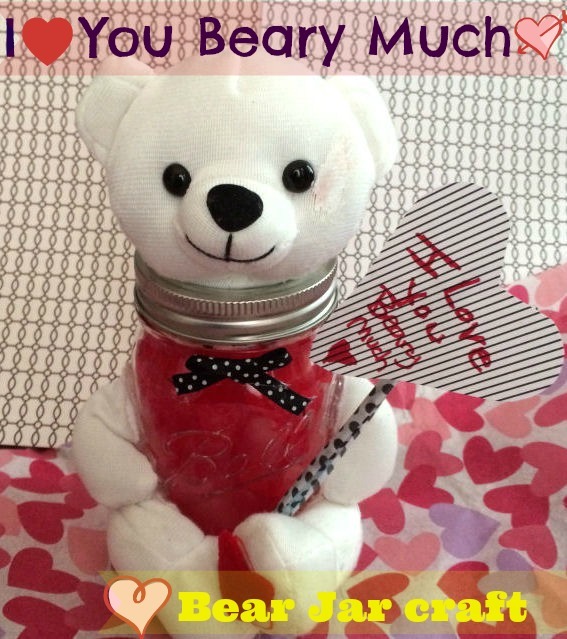 I chose – I Love You Beary Much! I taped his sign to a stick (cut from a sucker) and tucked the sign into his arm. I filled the jar with Cinnamon Bears, to continue with the bear theme. Now it’s ready to give to your Valentine! Happy Valentines Day. 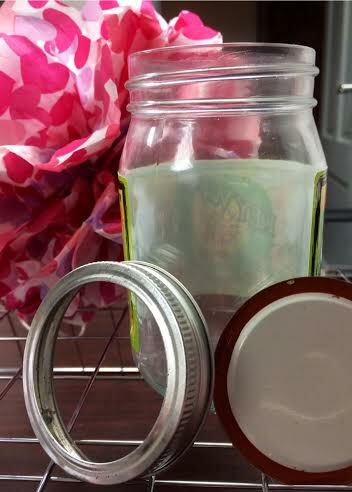 If you enjoyed this Valentine’s Day Jar Craft please feel free to Pin the images. For more Valentine’s Day Craft ideas check out this post 15 KID FRIENDLY Valentines Day CRAFTS So many cute ideas! Valentine’s Day Countdown, Easy Paper Crafts, Love Tree, DIY Arrow Wreath, Garlands and so much more! !